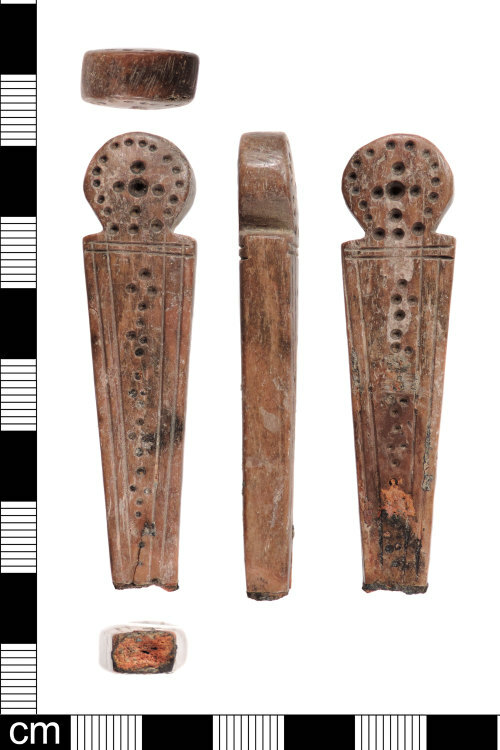 An incomplete Medieval ivory knife handle dating from AD 1100-1500. The handle consists of a rectangular section, which tapers to the grip, and a circular terminal at the widest end. The handle has a squared section. The handle is broken towards the blade end. The object is decorated with dots and a double linear engraving lines running around the edges of the rectangular section. The dots form a series of quatrefoils running up the centre of the handle, with larger quatrefoil or cross in the circular terminal formed of smaller dots around a larger central dot. There is also a border of dots around the edge of the circular terminal. The pattern is repeated on both sides. The handle has a light brown pattination across the surface. A similarly shaped knife handle is illustrated in MacGregor (1985, Fig. 88u) which is Medieval in date and another similar knife on the database is LON-273893. Dimensions: length: 64.79 mm; width: 16.23 mm; thickness: 8.14 mm; weight: 10.93g. Reference: MacGregor, A. 1985. Bone, Antler, Ivory and Horn. The Technology of Skeletal Materials since the Roman Period. Croom Helm, London and Sydney.